Sitting from left: Prof Dr Mohd Ismail Noor (Vice-President of Nutrition Society of Malaysia), Assoc Prof Dr. Umaporn Suthutvoravut (President of Nutrition Association of Thailand), Dr Tee E Siong (President of Nutrition Society of Malaysia), Dr Nguyen Duc Vinh (Ministry of Health Vietnam), Prof Dr Le Thi Hop (President of Vietnam Nutrition Association), Dr Rodolfo F. Florentino (Chairman-President of Nutrition Foundation of the Philippines, Inc.). Standing from left: Ms Yvonne Chwee (SEA-PHN Network Secretariat), Ms Cyndy Au (DuPont Nutrition & Health), Mrs Florentino, Ms Angie Low (Danone Nutricia Early Life Nutrition Asia-Pacific), Mr Victor Basuki (DuPont Nutrition & Health), Ms Goh Peen Ern (Beneo Asia Pacific Ptd Ltd), Dr Kit Phanvijhitsiri (PepsiCo Asia Services Ltd), Ms Muhaini Hussin (SEA-PHN Network Secretariat). Dr Vinh, director of maternal child health of Vietnam Ministry of Health shared his thought on how this network can contribute towards public health nutrition programme. The meeting reviewed the previous Minutes from the 3rd Annual General Meeting held on July 26, 2016 in Manila. 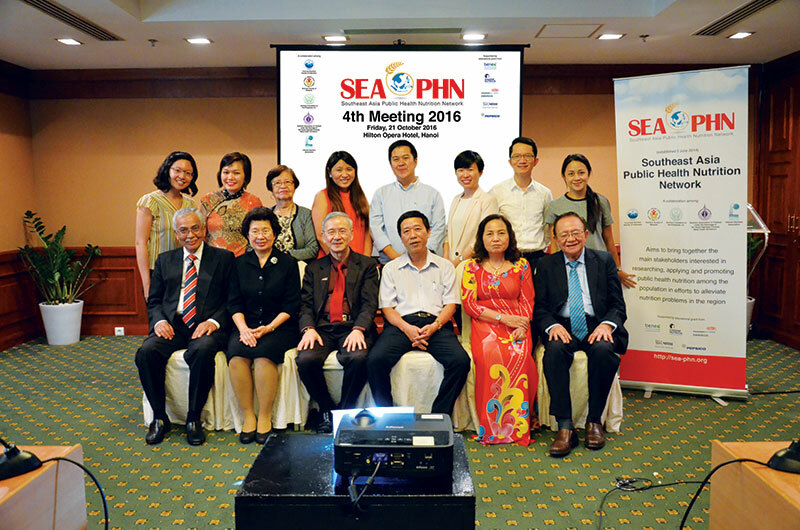 NSM updated the Network on the preparation on the 1st Southeast Asia Public Health Nutrition Conference in 2017, in conjunction with the 32nd Scientific Conference of NSM, under the auspice of the SEA-PHN Network. The meeting discussed various items on the conference, such as registration fee, programme structure, website, conference marketing and promotion, topics and speakers, etc. On the mechanism to conduct this programme, the meeting agreed to the approach of training the teachers where local nutrition associations/ societies are to select schools and conduct Train-the-Trainer Workshop for Teachers. The programme will commence with 1-2 pilot school, about 50 – 80 children in each country and have full force implementation in 2018. Compilation of NPAN is useful to obtain information and understand the approach by different countries planning nutrition programmes. For the compilation of nutrition situation of countries, as the data collection is massive, the meeting agreed to keep this project in view till a later date.